ORO DEL DESIERTO COUPAGE 5L: An award-winning, specially-crafted blend of Organic Arbequina, Hojiblanca and Picual olives picked between the end of October and beginning of November. The oils are then stored in 2,000 liter deposits where they are analyzed, then selected in varying quantities, and finally blended by the Master Taster to create a superb olive oil with a limited production. The result is a leafy green and golden oil with a bouquet of freshly cut grass, tomato, green olive with hints of citrus and dried fruits. Its taste is well-balanced and medium to smooth in intensity with a pleasant, slightly spicy aftertaste. ULIVA 500ML: A superb quality, award-winning oil resulting from the professional experience of Agraria Riva del Garda, Uliva DOP will meet the needs of those looking for a select extra virgin olive oil and who value a limited production DOP product that perfectly represents the territory of its production. 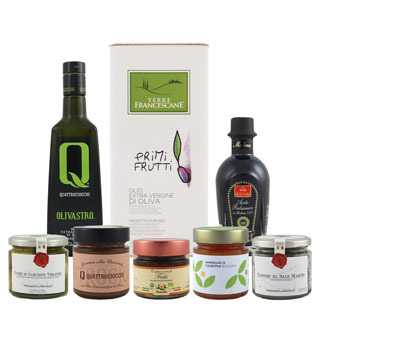 Uliva is a DOP Garda Trentino extra virgin olive oil pressed exclusively from early harvest Casaliva variety olives that are picked in the very first stages of maturation and pressed at the beginning of the season, generally before the 10th of November. The characteristics of the young olives are preserved in the resulting oil which has a notable fresh, crisp taste as well as an accompanying grassy nose. ACETUM SANTORINI BALSAMIC: This 4 Leaf Quality Balsamic Vinegar of Modena IGP is a special condiment obtained by grape must and wine vinegars produced by slow fermentation in wood. It is superbly lush and dense with a silky texture. Syrupy with complex flavors and a heady aroma, a few drops of this deliciously sweet vinegar are sufficient to add a particular perfume to every recipe. It also pairs perfectly with parmesan cheese, strawberries or pears, and vanilla ice cream. LIBRANDI ORGANIC ORANGE MARMALADE: A delicious citrus marmalade made from organic oranges grown on the estate of Tenute Librandi. The jam is made in small batches during the citrus harvest with organic brown sugar and a touch of lemon juice. *FRANTOI CUTRERA DRIED CHERRY TOMATOES: Sicilian sun dried cherry tomatoes in Frantoio Cutrera’s Gran Cru Tonda Iblea extra virgin olive oil combined with basil, Sicilian red garlic and Sicilian sea salt. Great for starters, bruschetta and sandwiches. FULL MOON GRAND RESERVE TRANSPARENT BALSAMIC PEARLS: Small caviar-like spheres filled with Full Moon’s exquisite transparent vinegar add a burst of flavor and striking presentation to any dish. With their protective membrane derived from marine algae, they have excellent thermal stability and can be used in both cold and hot applications supporting temperatures of up to 100ºC. Each spoonful is a delightful explosion of flavor in the mouth and are ideal to accompany oysters, hors d'oeuvres, or to finish a dessert. The creative culinary options are endless! XATHERI CRETAN THYME HONEY: This unique honey is made from wild thyme and herb flowers grown in the White Mountain of Western Crete. Produced in small batches by a small family bee keeping operation, this honey is totally natural and unpasteurized with the unique aroma of wild thyme and herbs of Crete. Renowned around the world for its amazing flavor and medicinal properties, thyme honey from Crete is a real treat for any honey lover.